Back in January during my library's annual staff day, my department spent our meeting time giving spark talks--high-energy, three-minute pitches of ideas that we think are cool and that the library could consider adopting. My coworker Rachel pitched the idea of "gratitude graffiti"--a visual, crowd-sourced community art project in which people express their thanks. She cited some examples where communities do gratitude graffiti around Thanksgiving. My department absolutely loved the idea, and we wanted to implement much sooner than November. Instead, we chose to make the Gratitude Graffiti project one of the cornerstones of our 2016 National Library Week celebrations. We celebrated National Library Week from April 10 through April 17, or Sunday to Sunday. During that week, we identified 14 different library programs for a range of audiences as well as 2 high-use spaces for the project. Staff took our Gratitude Graffiti supplies to each of those programs and spaces. Supplies included a black foamcore poster board with signage explaining National Library Week; an assortment of metallic markers to write on the board; and an array of cookies (kosher) and dates as a thank-you treat for participants. 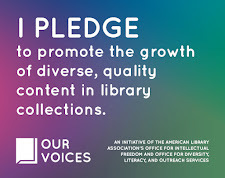 Basically, our goal was to give library users the means and opportunity to express a thought of thanks for what the library adds to their lives. To say we were blown away by the enthusiasm and responses we received is accurate. 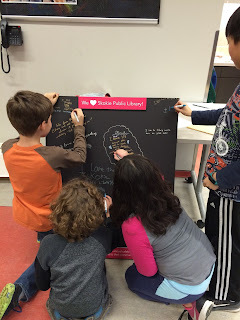 Patrons were consistently thrilled to have a chance to share a bit about what they love at their library. We had community college students who excitedly took a break from their quiet study on the second floor to doodle and say "thank you" for the consistent and comfortable space. We had a teen at an author visit express her appreciation for the fact that she can always find books with girls like her--from biracial backgrounds--at our library. 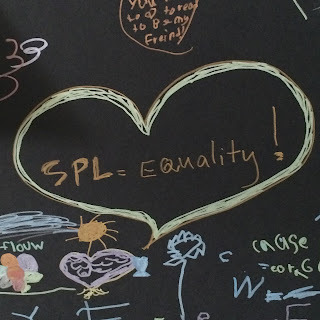 We even had a three-year-old storytime regular who was so excited to share what she loves about the library, she wrote her first letter ever on the gratitude graffiti board. That's huge. That's what the library can inspire in the people who visit. So here is my takeaway, and my challenge and question to others: We know, anecdotally, that the library is a place that is valued and appreciated in the community, but we don't always give our patrons opportunities to express that value and appreciation. Comment cards tend to end up about complaints, but we don't always have great methods for capturing the good and the positive impacts the library has. Then, with a relatively low-stakes initiative like the Gratitude Graffiti project, we get to see not only what we add to peoples' lives, but we can see that they're thrilled to share their appreciation with us. It's like they've been waiting to share their feelings but never found the right moment until we asked. How do you ask? How do you give your patrons opportunities to share beyond the everyday options? Because if there's one big thing we learned during our Gratitude Graffiti Project for National Library Week, it's that patrons are as happy to give gratitude as we are to receive it.